"Hit the Sauce" is the ultimate gourmet liquor gift with an assortment of famous brand BBQ sauces. 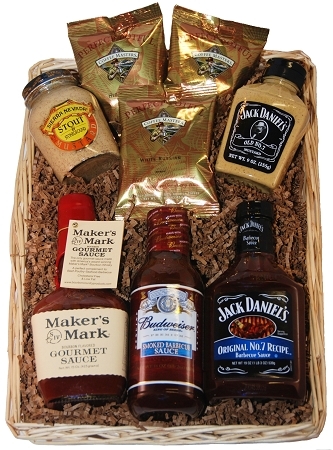 This BBQ-lovers gift basket includes some tasty sauces from America's favorite whiskey and beer brands: Jack Daniels Barbecue Sauce, Maker's Mark Gourmet Sauce, Sierra Nevada Porter Mustard, Jack Daniels Mustard, and Budweiser Barbecue Sauce - everything a true BBQ master needs to grill up a masterpiece. 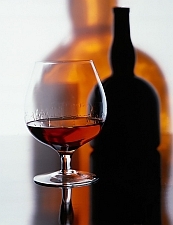 An assortment of White Russian and Irish Whiskey flavored coffees are included to finish any meal in style. 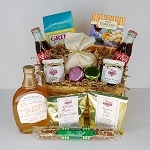 Hit The Sauce Barbecue Gift Basket comes in a handsome large handled BBQ gift basket, and includes the matching GiftProse greeting card and optional prose, along with your personal sentiment. 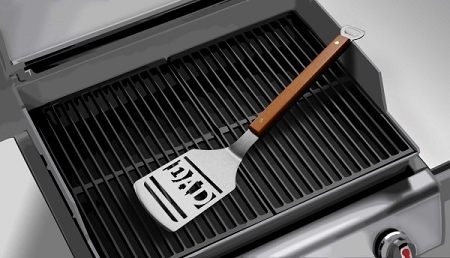 Add a Sportula: The #1 Dad Sportula, it is a heavy duty stainless steel grilling spatula that is perfectly designed for the grilling master. Unique laser-cut design Heavy-duty stainless steel Hard maple handles with durable brass rivets Convenient bottle opener Custom heat-stamped lettering Dimensions: 18 1/2" x 4"
Thought you might enjoy hitting the sauce on occasion – but just beware … you could become a two-fisted gourmet! *SHIPPING INFORMATION*ORDERS RECEIVED WILL SHIP WITHIN 3 BUSINESS DAYS. Orders do not ship on major holidays or weekends. 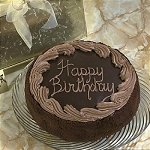 We recommend shipping to a business address wherever possible to insure timely delivery.PERISHABLE GIFT SHIPPING: We recommend shipping 2-Day or Overnight for baskets with perishable items (fruit, cheese, chocolate), 2-day shipping will be shipped Monday-Wednesday (arrival Tuesday-Friday). Overnight shipping will be shipped Monday-Thursday (arrival Tuesday-Friday). We can only guarantee freshness if these guidelines are followed.